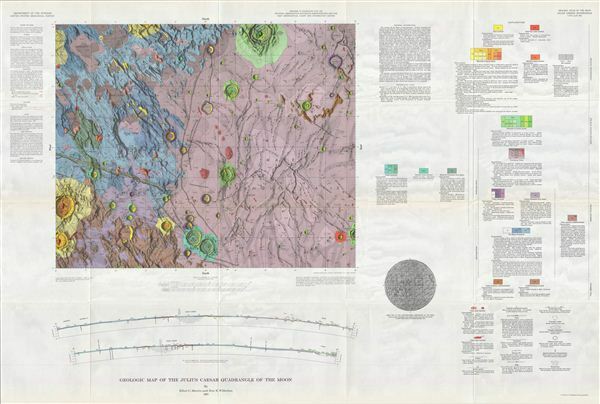 Geologic Map of the Julius Ceasar Quadrangle of the Moon by Elliot C. Morris and Don E. Wilhelms. This is the U.S. Geological Survey's stunning full color geological map of the Moon's Julius Caesar Crater and surrounding area. The crater is lava-flooded with a heavily worn wall and uneven floor heights. The area has many escarpments with tapered ends, symbolized by double-ended arrows, giving the map the appearances of armies or snakes moving in every direction. As humans wouldn't land on the moon until 1969, how were we able to map its geology? The map's extraordinarily detailed metadata explains that the cartographers used photos dating back to 1960 (remember the series of Ranger missions in the mid-60's? ), and observations from optical and radio telescopes, with relief created by measuring shadows, combined with an assumed sun angle and an assumed base elevation. The geology was arrived at from observing differences in, and layering of, topographical forms, and in varying albedo (amount of reflected sunlight), both of which indicate different underlying materials formed under different processes. The map also includes two sectional views (from the side) of the area, detailed ‘metadata' explaining the mapmaking methodologies and symbols employed, and an index map showing the area's location on the Moon. Created by elliot C. Morris and Don e. Wilhelms and published as plate I-510 in the United States Geological Survey's Geological Atlas of the Moon.